In response to ACLU lawsuit, federal judge temporarily allows people with valid visas who landed in the U.S. to stay in the country. A federal judge on Saturday night granted an emergency stay to temporarily allow people with valid visas who landed in the U.S. to stay in the country, CNBC reported. The ruling came following an appeal by the American Civil Liberties Union (ACLU) against President Donald Trump's executive order related to immigration from seven Muslim-majority countries. The ACLU and other activist groups filed a class action lawsuit earlier on Saturday, seeking to challenge the president's order. The executive order banned all persons from Iran, Iraq, Libya, Somalia, Sudan, Syria and Yemen from entering the U.S. The ban is effective for an initial and extendable period of 90 days. On Saturday it was reported that refugees from the seven countries were being turned away at foreign airports and that those who made it all the way to the United States were detained upon landing. The ACLU lawsuit said the government had unconstitutionally detained two Iraqi men who landed at JFK on Friday. The group estimated following Saturday’s ruling that it will affect between 100 and 200 people detained at or in transit to U.S. airports. It will not, however, stay the president's entire order. The petition filed in a New York federal court on behalf of the two Iraqis called Trump's move "unlawful." 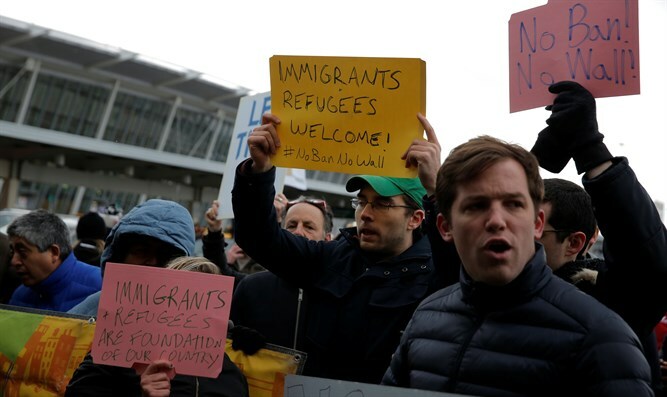 The case's two lead plaintiffs were held by authorities and threatened with deportation, the ACLU argued, even though both are authorized to enter the U.S. As a number of immigrants in transit were waylaid by the sudden shift in policy, spontaneous demonstrations erupted at JFK Airport on Saturday afternoon, according to CNBC. Governments around the world, particularly in the Middle East, have reacted angrily to the moratorium on refugees. Iran, for example, called the ban a “flagrant insult” to the entire Muslim world, and announced a reciprocal ban on U.S. citizens wishing to enter Iran.